Enveloped, spherical to pleomorphic, 150-200 nm in diameter, T=16 icosahedral symmetry. Capsid consists of 162 capsomers and is surrounded by an amorphous tegument. Glycoproteins complexes are embed in the lipid envelope. Monopartite, linear, dsDNA genome of 120-240 kb. The genome contains terminal and internal reiterated sequences. Each viral transcript usually encodes a single protein and has a promoter/regulatory sequence, a TATA box, a transcription initiation site, a 5' leader sequence of 30-300 bp (not translated), a 3' non-translated sequence of 10-30 bp, and a poly A signal. There are many gene overlaps. There are only few spliced genes. Some of the expressed ORFs are antisense to each other. Some ORFs can be accessed from more than one promoter. Certain proteins are downregulated translationaly by a leaky scanning from an upstream ORF. ASSOCIATED DISEASES HHV-1 and HHV-2: skin vesicles or mucosal ulcers (oral and/or genital). Rarely, encephalitis and meningitis. HHV-3: chickenpox (Varicella) and shingles. Congenital varicella syndrome may be caused by infection in utero during the first trimester. HHV-6: “sixth disease” (roseola infantum, exanthem subitum). HHV-7: symptoms analog to the “sixth disease”. HHV-5:Infected body fluids (urine, saliva), transplacentary, transplantation, blood transfusion. HHV-4: Saliva, sexual (probable), transplacentary. ANTIVIRAL DRUGS Nucleoside analogs (Acyclovir, famcyclovir, valacyclovir...). These drugs are activated by the viral specific enzyme, thymidine kinase, and are therefore specific to herpes-infected cells. These drugs act against the replicating virus (they are incorporated into the DNA as it is copied) and are ineffective against a latent virus. Herpesviruses have evolved different strategies to inhibit the host adaptive immune response. For example, Herpes simplex protein US12 binds specifically to transporters associated with antigen processing (TAP), blocking peptide-binding to TAP and subsequent loading of peptides onto MHC class I molecules . HCMV instead encodes a protein termed US3 that directly binds and inhibits host tapasin. Apoptosis is very often modulated (and usually inhibited) by herpesviridae. 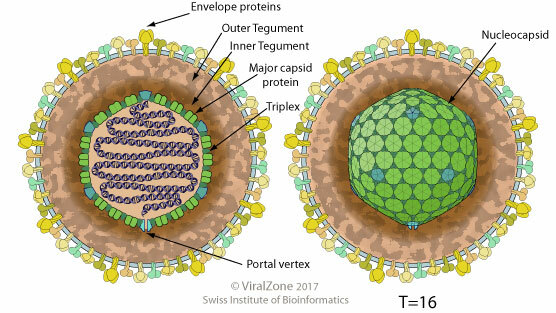 The mechanisms used can be caspase-dependent such as HCMV vICA that prevents host caspase-8 activation, or can involved the inhibition other cellular proteins involved in apoptosis such as EBV protein BHRF1, a viral homologue of the Bcl-2 that protect the infected cell against apoptosis. Several herpesvirus are able to inhibit host cell autophagy process , such as HHV-1 ICP34.5 that interacts with Beclin-1 and stop autophagosomes development. The UL24 protein that is present in all herpesvirus subfamilies ( alpha, beta and gamma-herpesviruses) induces a cell cycle arrest at G2/M transition through inactivation of the host cyclinB/cdc2 complex . Herpes viruses inhibit the cascade leading to production of interferon-beta by mainly targeting the host IRF3 protein. Thus, herpes simplex virus, varicella virus, or HCMV all possess proteins to prevent IRF3 activation.